Has anyone ever played this card successfully? Or used it its ability successfully? It will be more useful with the new shub box coming soon. For now there's not enough chtonians to put in your deck for it to be useful. I put it in my mono ramp Shub deck to have some big invulnerable AO to play, basically (and with her skill I can let Azatoth get Shudde M'ell from the GY via Necronomicon). I run 4-5 Chthonians in my deck (3 Grasping, 2 Telepathic, but it's not like there's really much choice), so it's not surprising that the ability is *almost* blank, but Shub is strangely lacking big Ancient Ones. I don't really like Nyogtha, no arcane, no invul - Shudde M'ell's stats aren't impressive either, but it can reliably contest/win the stories it's sent to and later on I *may* have otherwise useless domains I can use to trigger the ability. I hope the upcoming box gives us at least two new Ancient Ones besides Shub herself, since she doesn't allow for more AOs in total. Since none have been spoiled so far, I'm not that hopeful anymore, we might not even get one, but what shall I do. I just feel it's funny how "useless" the ramping often proves to be when it's Cthulhu who has way more AOs/expensive (and worthwhile) big creatures, heck, Cthulhu has almost double the number of five-drops, I just checked. She just seems like Y'Golonac but worse. Costs 2 more, has 1 more skill and the same icon. Y'Golonac has a better ability as well. 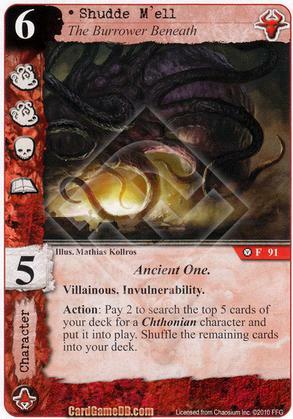 I supposed, post-Shub expansion, that if you Under-the-Porched the new Ancient Chthonian you could use Shudde to play 5 Chthonians for 2 cost, but that deck seems more awkward and less reliable than the good old Shub-Niggurath Dark Young doom drop. Graham, how does Shudde M'ell let all 5 of the Chthonians be played for 2 cost? It seems like the ability specifies putting one into play. She's just waiting for enough reasonable Cthonians. Are we there yet with this box? Dunno until we get it. Yup! I had already built a Cthonian/Monster deck with the current card pool, and alas, it got better after removing Shudde M'ell. It's such cool art and not a bad character, so I wish it were more playable. The problem is that chthonians drive up the curve of the deck overall, and if you are trying to build with Shudde M'ell in mind, you will need serious resource ramp or something like Broken Space, Broken Time to get him into play. It should get better with Ancient Chthonian to get them to the top, probably in combination with sac'able supports like Under the Porch and the new Ghoul Tunnels. Having all the chthonians out will provided excellent support control and a lot of pressure on board presence. But we won't be able to prove this until we test decks with these two new cards. Has anyone proxied them and tried it out? Arthur Todd is maybe the best way to discount Shudde M'ell, and probably allows the Ancient One's ability to be used immediately. I sympathize with Daevar's comments above. Nug is a great card, and you get all excited about ramping up all your resources... and then you just sit there with lots of resources and nothing to play. There aren't enough big Shub characters worth playing to leverage the ramp. Don't get me wrong, there are a couple good heavy Shub characters, but not as many as you'd think for the most character-heavy, character-happy faction. Look at the 3 heaviest Shub dudes from The Thousand Young box - Shub-Niggurath, Ancient Chthonian, Dark Sargassum. That's 8 T icons and 7 C icons between them. Yes, they all have serious skill (thank goodness), but none of them have the diversity of icons or the icon boosters that typically make for good story attackers. What they all DO have in common is they all attempt to spawn more Shub characters, meaning you'll be rewarded with yet more T icons and C icons. And most of the characters they're spawning are probably in the 2-4 cost range, which means you might already have some of them on the table. Now, you've just got more of them. The same thing that makes the Shub faction charming is what makes it frustrating. Your big characters don't do much by themselves. In Magic the Gathering lingo, they just sit there like big walls. They bring friends with them to the party, but most of their friends are just smaller versions of themselves. So, you'll be in great shape to not lose the game, but you won't be in any better shape to actually win it.